Well folks, I’m out of the country again for a solid month starting tonight. So these two pictures may be the last updates for a few weeks. I’m bringing a baby sketchbook and pencils, but tablet stays at home, so expect very little updates unless they’re instagram’d photos of art or something. If you want to know more of my shenanigans, I’m always updating my flickr, twitter, and tumblr. 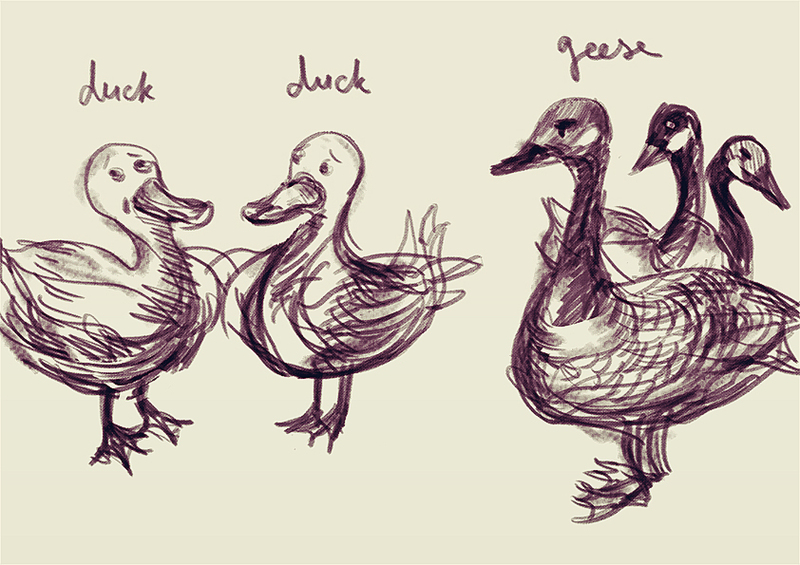 Here are some neurotic ducks for you. And angry Canadian geese. Scary, they are. Two friends who wanted a drawing to put up in their home. Now they can stare at themselves. 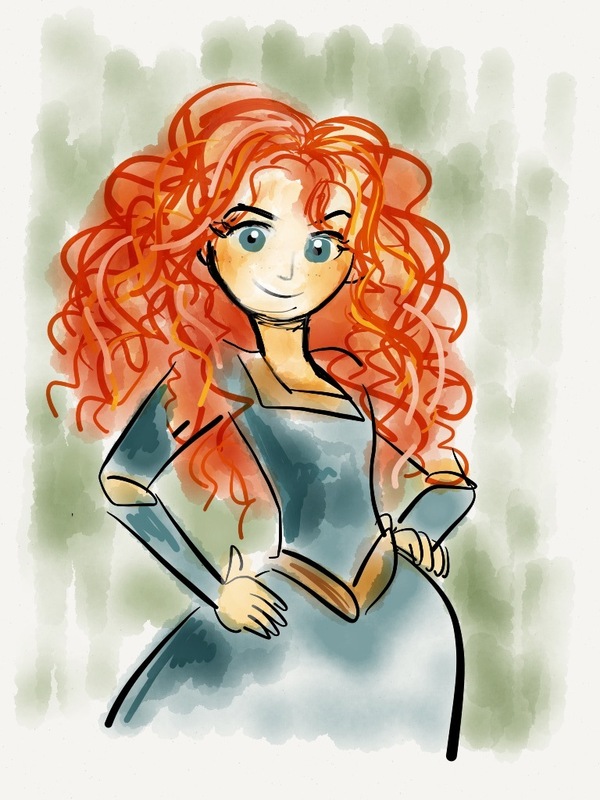 Here’s Merida. I drew her from memory, so don’t nitpick about her clothes. I liked Brave! I didn’t love everything about it, but I’d say it did what it set out to do: tell a story about a mother and a daughter. The emotional resonance succeeded for the most part, in that special way that only Pixar movies can showcase. Female characters do not exist solely to find mates. People would do well to remember this. Drawn on an iPad using the Paper by FiftyThree. I really like Zen Brush, too, but it’s not as intuitive as Paper. I’ve tried Sketchbook Pro and I found it so-so, and I think I paid for a few that really did nothing for me, since I can’t even remember their names. Anyone have any other app recommendations? More book illustration / fanart today, hoo hoo. 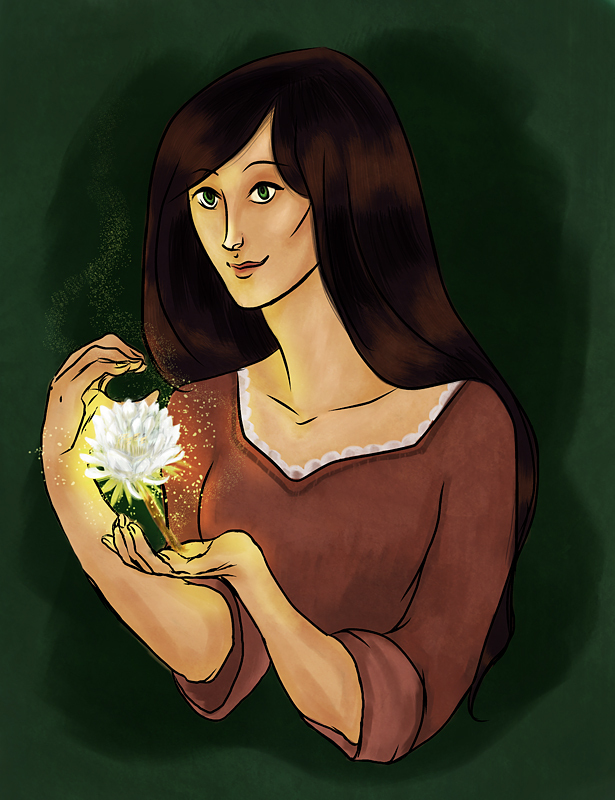 This here’s Moirin, the main protagonist of Jacqueline Carey‘s second trilogy set in the Terre D’Ange universe. She’s got the ability to coax plants and make ‘em grow, among other skills. She’s one great character, because she’s totally believable — she’s young, makes mistakes (of the heart, ha), acts on impulse, is filled with wonder for the world she is in, and has a great heart. I completed this one a while ago – I think in December, or early January (it’s June now, right? Yikes!). 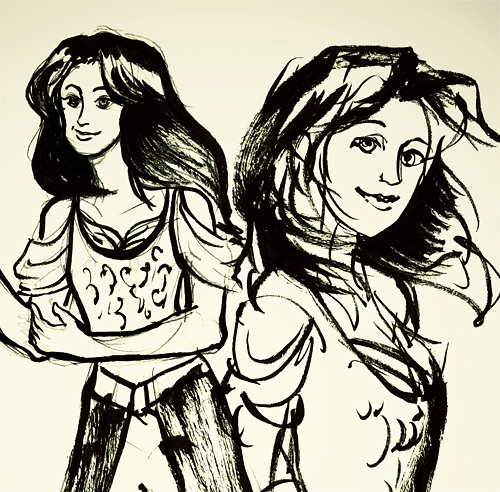 All I remember about the process is that I went a little texture crazy (and probably did my line art in Manga Studio). My composer friend Christy has been using my Kushiel art for her Eglantine Adept music page, so if you like Kushiel-related goodness check out her facebook page. 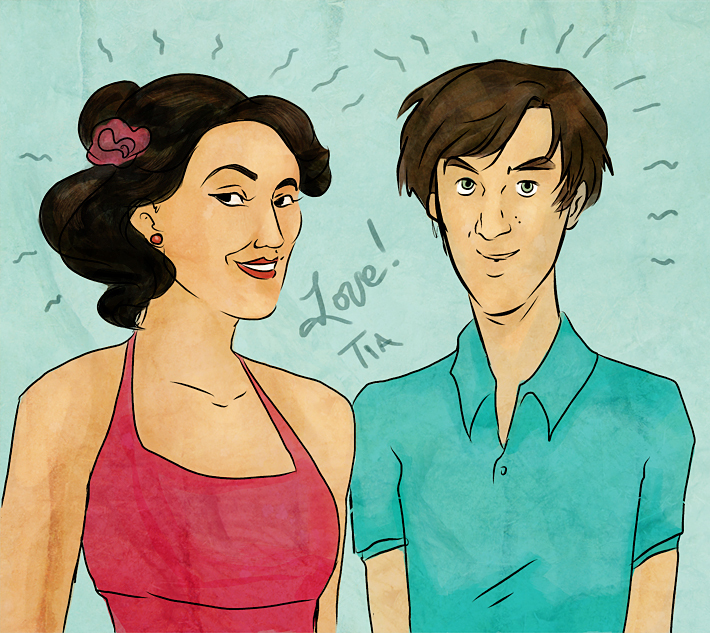 Another book fanart illustration catastrophe! Exciting. 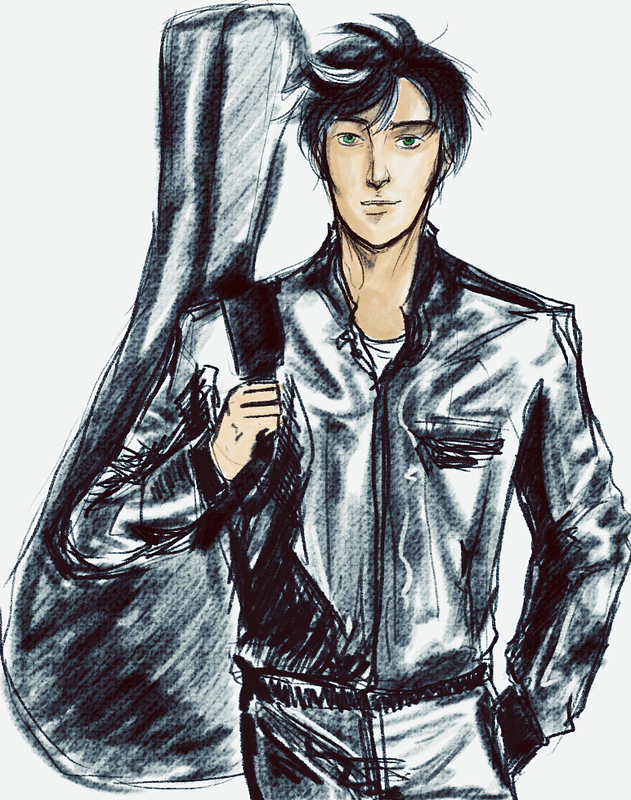 Willy Silver, the guitarist (and a little more) from War for the Oaks (Emma Bull). He’s meant to have a streak of white hair, green eyes, and be dressed head to toe in leather when we first see him. Aka HELLOOO NURSE, etc. I happen to be fairly adept at drawing pretty-boys, so this drawing was definitely in my comfort zone. War for the Oaks by Emma Bull is a delightful book. This is my idea of the main character, Eddi. 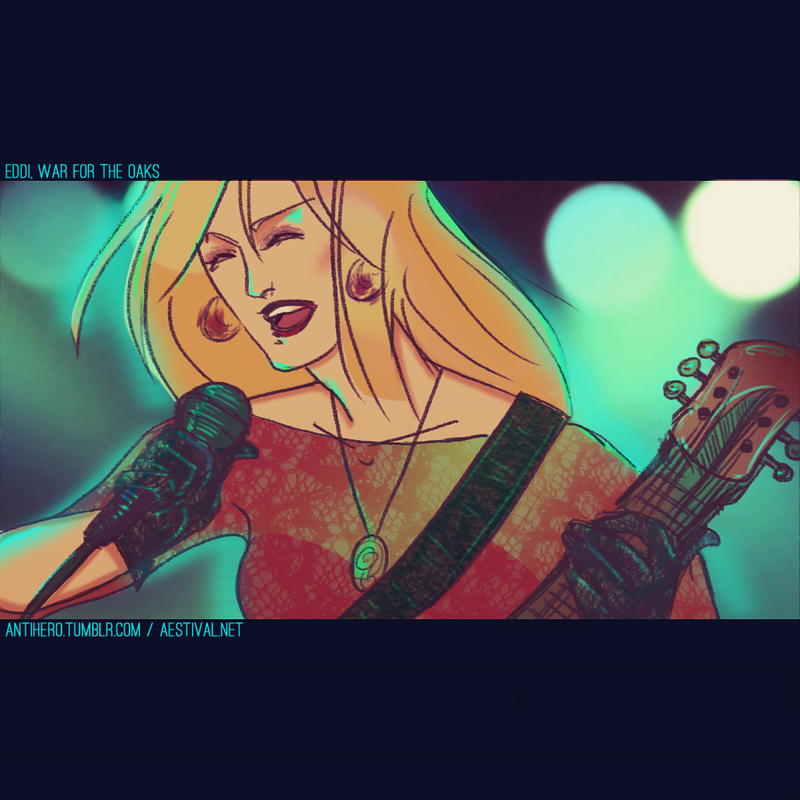 What I remember about her (visually) was that she has blonde hair, sings, and plays a red Rickenbacker. She does sport some kickin’ outfits during the course of the book, but I played around and designed my own for her. I didn’t intend for the colors to turn out the way they did (I don’t think I ever really have intentions for my colors, sigh, haha), but I must say I like the way the red and electric turquoise contrast. I drew Willy Silver, too, but maybe I’ll post him tomorrow. Twee twee twee, I said I’d post again and here I am. It’s a color piece today, completed a few nights ago. 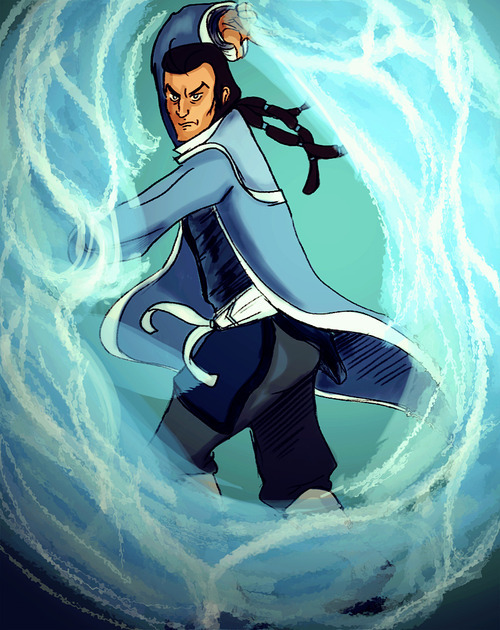 It’s a character from Avatar: The Legend of Korra. Show is seriously addicting! It’s a trade I did with my friend Brett. He drew Lin Beifong and I drew Tarrlok. He’s a sneaky sneak, and I really enjoy his character design, so good times were had by all. 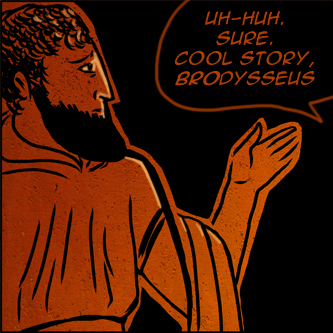 I thought I said I’d update all the time! What the heck is wrong with me! I’m going to post DAILY this week to compensate. 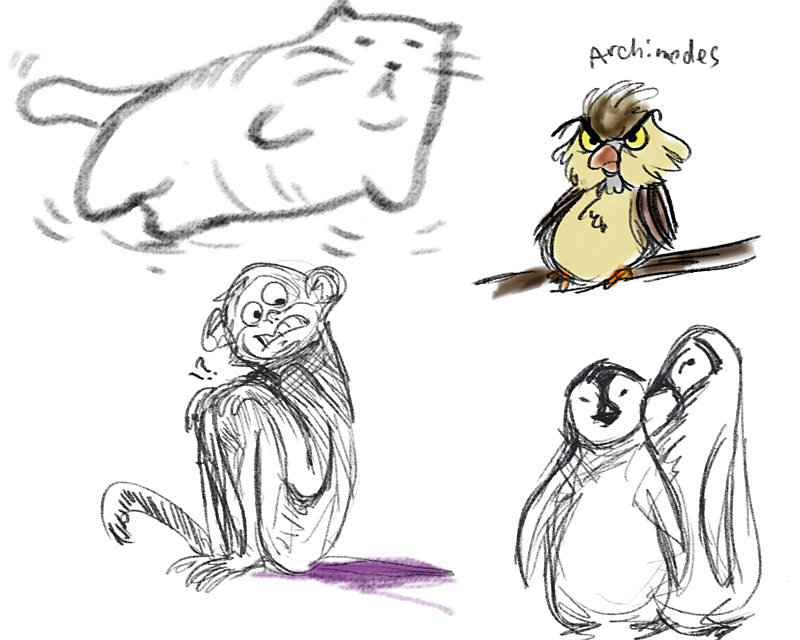 Here are some doodles that were created based on my prompting friends on facebook as to what I should draw. 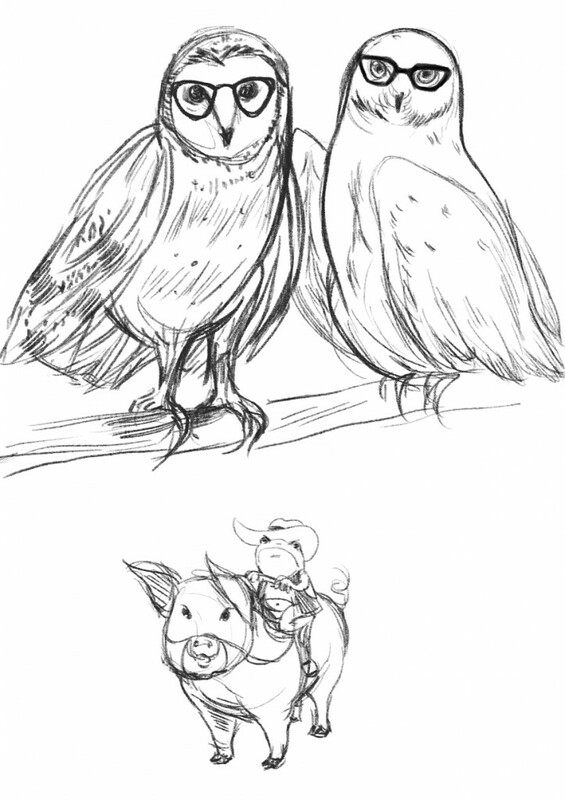 For whatever reason the thought of drawing animals, specifically penguins and owls and Sheriff Frog riding a piglet, appealed to me the most. Hi world! I’m starting medical school this week so I can’t promise updates any more until May. I have a few options but I hope you understand my radio silence! Here’s some doodles of an original character I created with my brush pen. I’ll be the first to admit I don’t know anything about Halo. Most attempts to play it end up with me holding the controller upside down. 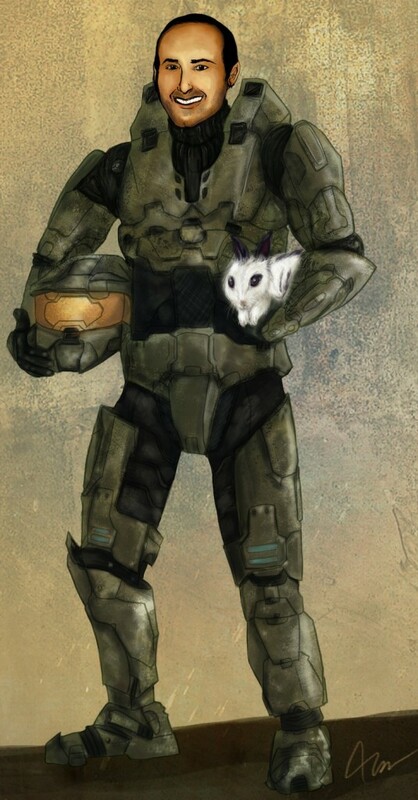 But when my friend Sarah asked me to draw her friend Eric as Master Chief, I happily obliged. He owns the armor in real life. So it’s like art imitating life imitating art. With a bunny.